We head to the shires of Nottingham and Lincoln to explore the best of this beautiful areas Christmas markets. Grab that special, unique gift and marvel at the wonderful festive atmosphere! A regular winner of Lincolnshires Hotel of the Year, our hotel offers comfortable accommodation, a beautiful oak beamed restaurant, fantastic leisure facilities and a warm welcome in the bar. All rooms feature en-suite bathrooms, telephones, remote control television, hairdryers, tea and coffee making facilities. This hotel has a lift. 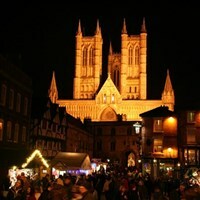 Lincoln Christmas Market - We enjoy a day at Lincoln Christmas Market, the largest in Europe and the UK's most frequently voted 'Best' Christmas Market. Lincoln offers wonderful street entertainment and over 250 seasonal stalls selling arts and crafts, jewellery, festive food and drink, a wonderful experience! Newark Christmas Market - Today is Newark's annual Christmas Market and Christmas Tree Festival! The festival fun includes over 100 Christmas trees which will be beautifully decorated by local schools, organisations and businesses. You can also expect an array of stalls offering gifts and hot seasonal food, there will be street entertainment and carol singing, fairground rides, and of course Santa in his sleigh!